Join us this summer for the 31st Annual ShopRite Nutmeg State Games Swim Meet hosted by the City of New Britain and Central CT State University! This is a great opportunity to compete in a statewide meet in Central Connecticut. This year's Swim Meet will be held on Sunday, August 4th. Medals will be awarded based on our age group offerings: 8&U, 9 to 10, 11 to 12, 13 to 14 and 15 & Over. Photography will not be allowed on deck or behind the blocks. Participants must submit entry times on the registration form. Heats will be seeded by entry times. Heat and lane assignments for entries submitted without seeding times will be determined by draw. No on deck entries, no event changes will be permitted after registration deadline. The Nutmeg State Games will NOT be offering relays for the swim meet. No alcoholic beverages or illegal substances are permitted in the possession of athletes. Behavior on and off the competition field by any person’s associated with the "Games" must follow the highest standards. Use of foul or abusive language constitutes a violation of the Code of Conduct. All athletes must respect the decisions of the officials and umpires during and after competitions. Any harassment will constitute a violation of the Code of Conduct. Unruly behavior by spectators towards players, coaches, volunteers, and/or officials will not be tolerated. Such behavior may result in the dismissal of the offending spectator from the competition site. Any participant’s behavior deemed in violation of the Code of Conduct, as decided by the Nutmeg State Games administrative staff, subjects the competitor to expulsion from the "Games". Events are open to all Connecticut amateur athletes who register with the Nutmeg State Games Office. The Nutmeg State Games reserves the right to cut the meet in the event of over subscription. 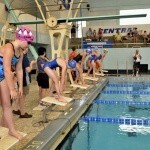 This event is recommended for those who participate in an organized swim program or team. Note: The age cut-off date will be the day of the competition/meet (Sunday, August 6th). Participants entering an individual sport competition or meet are requested to submit an Individual Sport Athlete Registration Form and the Appropriate Individual Sport FEE as soon as possible to enhance their chances of competing in the Nutmeg State Games. In addition to the Individual Sport Registration Form and Individual Sport Fee participants are requested to include PROOF OF AGE for certain sport offerings. Please see the list of Sports below that require submission of proof of age. Proof of age includes a copy (please do not send originals) of one of the following: valid driver’s license, copy of a birth certificate or a copy of a passport. You have the option to either Register ONLINE or by HARDCOPY - You do not have to do both! Proof of age (a COPY of one of the following: Driver’s license, Birth Certificate or Passport). The Nutmeg State Games Administration will notify a participant of his or her status by a confirmation email once the Registration goes through. Participants will be selected on a first come, first served basis. Participants not selected because of receipt after the registration deadline or other specified date (please see appropriate sport for registration deadline dates) will receive a full refund as soon as verification is possible. The Nutmeg State Games administration works closely with all Connecticut media outlets regarding any interesting stories about athletes and teams that will be participating in the "Games". If you have an interesting story to tell, we are all ears! Human interests stories typically address situations "off-the-court". Do you volunteer in the community? Are you great at something other than the sport you are playing? Are you following in the steps of a a sibling or parent? Of course, if you are doing something great on the court please provide us with all the details. If you, your team or someone you know fits any of these questions, please pass along this information or feel free to contact our office, and we would be happy to coordinate coverage on their behalf. - Please send all info to info@nutmegstategames.org. $35.00 will allow participants to compete in up to two (2) events. Participants will not be allowed to compete in more then five (5) events. Pre-Registration ONLY. No onsite Registration will be allowed!